The pasta was boiling away. The meat was browning in the skillet. This was going to be some great spaghetti. I went to the pantry to pull out the jar of spaghetti sauce - and there wasn't one. I looked everywhere and was then reminded that I'd already used it. I'm not an improvisational cook. I''m firmly rooted in recipes and guidance from others. But here, I didn't have that choice. 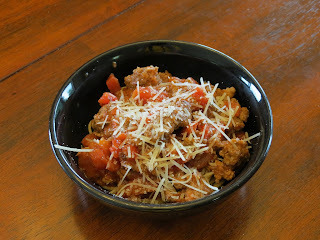 The truth is, this sauce turned out amazingly wonderful. The chilies gave it a little kick and it wasn't runny like jar sauce. Plus, I felt pretty good about my culinary skills in a pinch. It doesn't get much better than that. Yesterday was my 36th birthday. (Special, wonderful thank-yous to everyone who helped me celebrate.) It was a lovely day, one that makes me excited to see what this next year will bring. If it's anything like this past year, it's going to bring change. These 12 months have been filled with a myriad of new, different, sometimes good, sometimes not-so-good changes. But think about it - aren't we changing a little every single day? We learn something, experience something or receive something that makes us different than when we started the day. It's the little things that really add up to making huge changes in our lives. We only really see the impact of these changes when we step back and look at the time as a whole. It's like trying to watch your hair grow every day versus noticing the difference six months later. This is one of the best parts of summer when you have black labs. 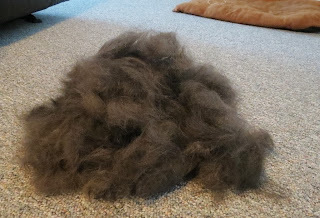 They're trying furiously to get rid of their heavy coat so they'll be cooler, and you're furiously trying to keep up with it so there's not fur everywhere. But once they've shed all that extra, heavy, unnecessary fur, they feel so much better. They're lighter and happier and bright-eyed again. One of my favorite things in the entire world is spending time in the kitchen with Danny. I learn so much - because he's so much smarter with ingredients than I am - and we have such a wonderful time. 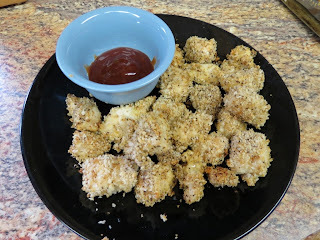 So when I told him that I had an idea for a double-seasoned chicken but didn't know how to make it happen, he stepped up and had some great ideas. Here's our recipe, thanks to a lot of teamwork! 1. Preheat the oven to 425 degrees. Line two baking sheets with foil and spray with non-stick spray. 2. Toss the chicken in a bowl with Cajun seasoning and Pinch of Herbs, to taste. I enjoy flavor but not too much heat, so Danny kept it pretty tame for me. Do you ever get tired of creating the same cards over and over again? Are there new ways to do something different with tools you already have? I answered both of those questions this weekend with a resounding "YES!" Creativity needs a little boost every now and then, and this punched card did it for me. 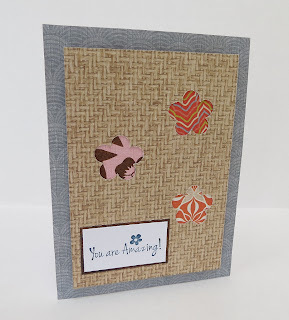 Just by backing the punched images with contrasting paper, I was able to made a 3D card that literally "popped." All you have to do is randomly punch you paper. Any image will do. Then choose papers that are drastically contrasting so they'll really stand out.What? These don't you say? Well, that's because this is the back of the top layer. Use regular one-sided tape so it won't stick to the card. We're going to raise it on 3D adhesive! And it's that simple. Imagine this with butterflies or circles for bubbles or another great shape. Can you imagine what it must have been like for the Israelites to stand at the bank of the Red Sea? Perhaps they could feel the hooves of the Egyptian horses beating through the ground. Maybe they could even hear the soldiers yelling out their battle cry. And all they could see before them was water. 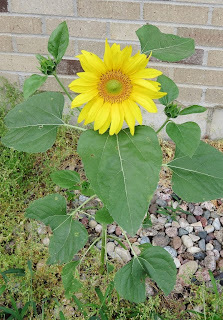 I didn't plant this sunflower out in front of the house, but it's growing up big and strong all on its own. The stem is almost half an inch thick and I can't wait to see how tall it's going to be! Sunflowers are a great example of how we can be grounded and strong in our faith. To hold up such a huge flower, the stem has to be proportionally thick and strong. The roots run deep to maintain that firm foundation in the ground. Make this a weekend of strength. Find a few verses of Scripture, like this one, about the strength that comes from knowing the Lord. Take advantage of opportunities to share that strength with those in need. And build up your own strength so your stem will be strong and your roots deep. Summertime is the perfect opportunity to create some adorable mini fruit pizzas. 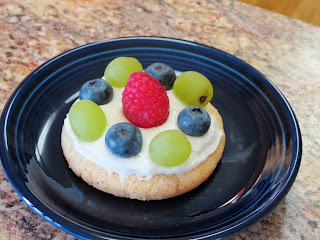 And who doesn't want to eat their RDA of fruit when there is delectable frosting and a sugar cookie underneath? 1. Combine the frosting and fluff in a bowl. You'll have enough for about 24 cookies - if you don't sample too much of it. And trust me, that's really an issue. 2. Spread the frosting liberally over each cookie. 3. Decorate with your favorites fruits. Small ones work best, like blueberries, raspberries, grapes and even sliced strawberries. When I took these to the church picnic, I used patriotic colors for my fruit. They were gone before I even got through the line. So I made more when I got home! 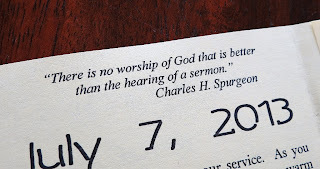 This Spurgeon quote is at the top of our bulletin every Sunday morning. I agree whole-heartedly, and I love seeing it there, reminding me to worship the Lord through actually listening to the preacher's message. But aren't there times when we listen half-heartedly, when we think, "Well, I hope someone here is getting something out of this. It's definitely not for me"? I already tithe, so I don't need to hear a message about tithing. I'm not in a storm, so I don't need to hear a sermon about weathering the storm. I don't cheat or lie or swear, so I don't need to hear messages about those sins. I think our family's doing pretty great, so I don't need to hear a sermon about strengthening the family. I'm not bitter or angry in my soul, so I don't need to hear a message about clinging to God more than ever. It must be someone else's message. I spent the better part of an hour on my knees yesterday - scrubbing the bathroom floor. Now, if you know me, you know that I hate cleaning the bathroom. I also have fibromyalgia, so this type of serious cleaning is also very painful. But it has to be done, so I take care of it. While I was down there this time, my mind wandered. Probably not a new occurrence for my brain, but it wandered some fun and interesting places, and I wanted to share those random thoughts with you. * Time on your knees gives you a better perspective. The floor looked pretty OK as I was standing up, but once I got down on my knees, I realized just how much fur and hair and hairspray there was. That change in perspective makes all the difference in what you really see. Did you ever have one of the moments where you see something and wonder why you never thought of that? It's so blissfully simple, but it just never crossed your mind. 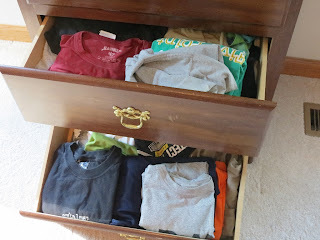 I saw a picture of a t-shirt drawer and it looked very much like this one. This is most of Danny's t-shirt collection from over the years, but I absolutely hate these drawers. It's impossible for him to see what all is in there, and they never stayed folded up and looking nice. The answer was so easy, but I sure never thought about it. Just fold them small, like you're packing a suitcase, and then store them vertically instead of horizontally. It's very much like either looking through a pile of CDs or flipping them all up on end to see the name written on the spine.